There’s maths to be found in all sorts of places. If you’re mindful of the opportunities you can weave some practical maths games into your everyday routines and play – giving your children the counting, sorting and matching practise that forms the foundation of later maths (and literacy) skills, without sitting down for formal lessons or loosing a playful approach. Toddlers and pre-schoolers usually love to help with the household chores so here are three ideas to mix in some maths. 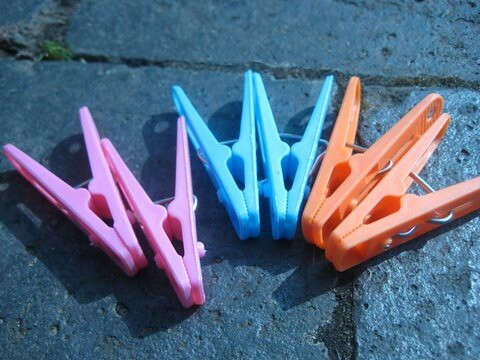 When you hang out the washing together ask your helper if they can match the clothes pegs into colour pairs and pass you them two at a time to peg up each piece of clothing. At a mealtime have your child work out how many people are going to be eating. 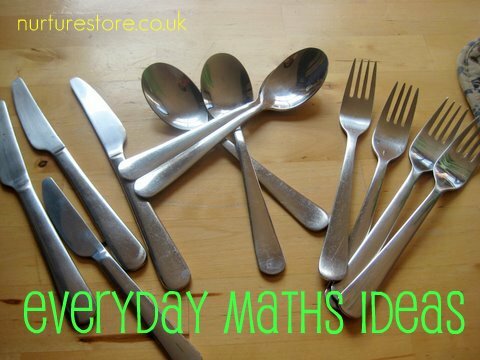 Ask them to pick out the rigth number of cutlery and sort them into knives, forks and spoons. At laundry time, matching pairs of socks is tailor made for toddlers! These activities let young children see how maths is important in the real world and help them practise their skills in context, which is a more valuable learning experience than using a set of flashcards. They also let you mix in some maths whilst still getting on with all the chores you need to do. Couldn’t agree with you more. One of our favorite activities also brings in some science – cooking/baking. As with most people, when you can learn hands-on and from a realistic event or situation the lesson is not only learned quicker, but remembered. Very true cathy! Its fun involving the kids in day to day chores and providing opportunity to learn. Catherine, it sounds like Minnie is having a great time. We really enjoy garden play too. It’s so true that there is learning in everyday activities! It’s all about giving our kids the language while they’re playing/living everyday life. Thanks for reminding me!! !